[11C]GV1-57 localizes to the OE and exhibits saturable binding. (A) Representative coregistered CT and [11C]GV1-57 PET images (SUV, NIH+white, 3–45 minutes) following treatment with [11C]GV1-57 (0.97 ± 0.097 mCi per animal). [11C]GV1-57 uptake is specific to the OE, which is circled in red in sagittal, transverse, and coronal views (left to right). (B) Representative [11C]GV1-57 PET images (SUV, NIH+white, 3–45 minutes) following pretreatment with nonradiolabeled GV1-57 (i.v., 16 mg/kg) 5 minutes prior to administration of [11C]GV1-57 (0.89 ± 0.032 mCi per animal). (C) Binding potential (BP) quantification of [11C]GV1-57 uptake in the OE of rats treated as described in A and B. BP was determined using a Logan analysis (Supplemental Figure 2). Error bars are ± SEM; n = 3 per group. ***P < 0.005 using a 2-tailed Student’s t test. (D) Averaged time-activity curves from rats treated as described in A and B. Error bars are ± SEM; n = 3 per group. %ID/cc, percent injected dose per cubic centimeter. 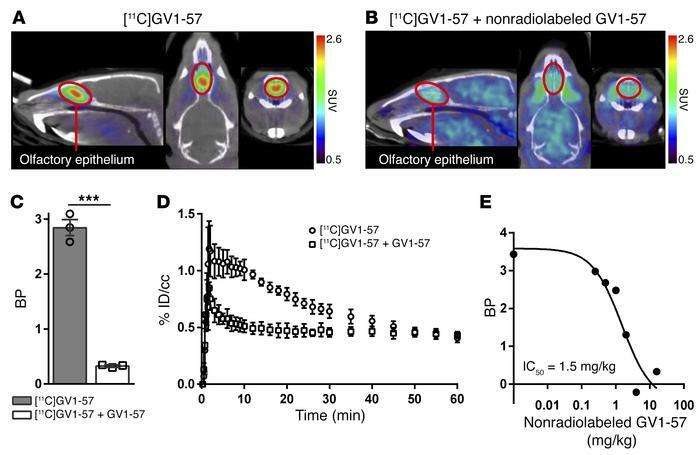 (E) In vivo IC50 curve for [11C]GV1-57 (IC50 = 1.5 mg/kg, ~20 μM); rats coadministered with [11C]GV1-57 (0.52 ± 0.025 mCi) and increasing doses of nonradiolabeled GV1-57 (i.v., 0–4 mg/kg). Graph includes the [11C]GV1-57 BP obtained in C for animals pretreated with 16 mg/kg nonradiolabeled GV1-57.